Froyo has been hanging on at 0.1% of active Android devices for ages, but now it's dropped below that mark and is no longer included in the platform numbers. It was still there last month. Now that Froyo is dead, we can start the Gingerbread Deathwatch. It's currently sitting at 1%. Speaking of 1%, that's more than the combined share of Nougat devices right now. 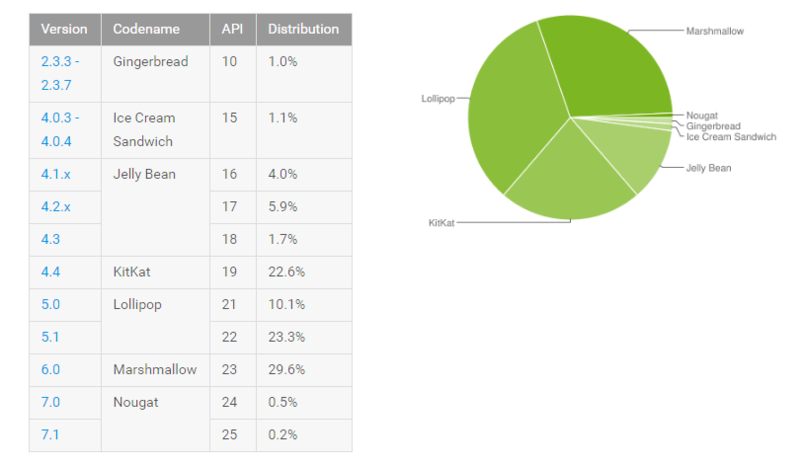 Google has split Android 7.0 and 7.1 up in the data, but combined they're only 0.7% of active devices. That should shoot upward as the 2017 flagship devices start dropping. Marshmallow is up 3.3% this time, a healthy gain. It's the biggest single version number (6.0), but all builds of Lollipop combined are still larger. Everything else is only changing by fractions one way or the other.